I was going to take the day off from blogging this weekend and just stick with blogging every weekday, but instead I’m going to show off the awesome lunch I had today. Flore Cafe has been having themed all you can eat buffets on the weekends for $10. 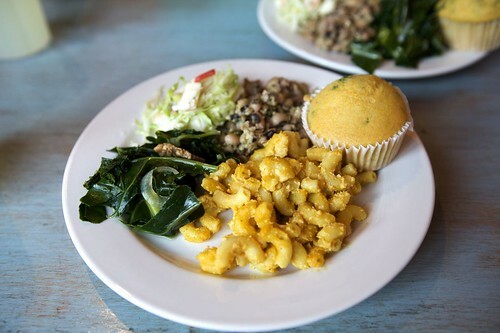 Today was vegan soul food including mac and cheese, black-eyed peas, collard greens with tempeh, cole slaw and a corn muffin. What could be better than all you can eat vegan macaroni and cheese? I ate 2 1/2 plates of food, so I think I got more than my money’s worth. The cole slaw was honestly the best slaw I’ve ever had in my life. I don’t even particularly like cole slaw but I wanted to eat tons of this stuff. It was fresh, crunchy and sweet. So good. Sunday, they have their all you can eat vegan brunch which I highly recommend.They have some great vegan french toast and seitan cutlets. There honestly isn’t a better brunch deal out there.